Laburnum × watereri is a deciduous flowering tree. A cross between Laburnum anagyroides and Laburnum alpinum (trees indigenous to Southern Europe), Laburnum × watereri is a hybrid plant. If you've observed plants extensively, a quick glance at either the leaves or the flowers will tell you that they are in the legume family. Golden chain trees reach 15-25 feet in height; spread can be of similar dimensions. Whereas we're used to seeing trees with a gray or brown bark, young specimens bear a smooth, green-colored bark. On older specimens of Laburnum × watereri, the bark is often darker and deeply fissured. Leaves are trifoliate and look like pointy clover leaves. But laburnums don't exhibit dense foliage, and it can be hard to predict their branching patterns. All of which is of little consequence since they are grown for only one reason: the gold racemes they produce in May or June that give them their name. Reportedly fussier than many plants about climate, Laburnum × watereri is a Goldilocks of the plant world — and not just in appearance! It is said to grow best in the rather narrow range of planting zones 5-7. Just like Goldilocks in the fairy tale, they don't like it too cold, but they don't like it too hot, either. They require a climate that is "just right," especially if you demand an optimal floral display (see below under Problems). Grow in a well-drained soil with a pH that is neutral to alkaline. Laburnum x watereri prefers partial sun (although some grow well in full sun). Laburnums are susceptible to sun scald and their branches may suffer some damage during challenging winters. Consequently, they benefit from being grown in a sheltered location. They often thrive when planted in a nook (off of a patio, say). Blight, canker and leaf spot are said to be potential diseases to keep an eye out for with Laburnum × watereri. Spray for aphids and mealybugs as needed. Young specimens require staking, as the trunks are quite floppy. The young branches are also weak. It’s a good idea to prune off some of the more awkwardly situated ones after the blooming season, as a preventive measure against winter damage. Unfortunately, the flowers are relatively short-lived. In moderately cool weather, blooms may last 2-3 weeks. In warm weather (especially in a full-sun location), the blooms last less than that; and even if they don't drop off, their bright gold color will fade to yellow. If heat does not get the blossoms, then the cold might: the floral display on mine in 2008 was decimated by a late frost. These are poisonous plants, so they are not a livestock-friendly, pet-friendly or child-friendly plant choice. All parts of the plant are toxic, including the seed pods. You will be better able to enjoy them there. The shelter will help shield them from the ravages of winter. Hands down, the outstanding feature of Laburnum × watereri is the racemes of yellow flowers with which it drips in late spring. In fact, this specimen holds little visual interest during the rest of the year. The racemes have a strong fragrance; compelling rather than sweet, it is an acquired taste. 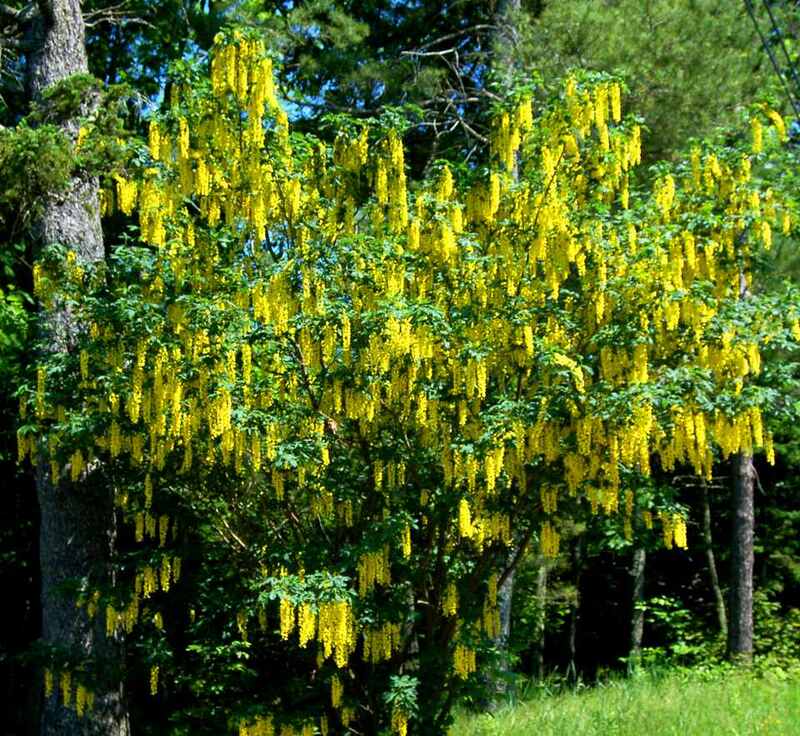 But everyone immediately falls in love with their bright, cheerful appearance.The gold racemes of Laburnum × watereri may be 10-20 inches in length. These beauties grow abundantly in Bar Harbor, Maine (US), where Laburnum × watereri is relatively common. They aren’t seen much elsewhere in New England. Could its rarity stem from the ephemeral nature of its beauty? But its short blooming period hardly constitutes a sufficient argument against growing Laburnum × watereri. Who's to say you can't derive as much joy from a plant that's a 10 (on a scale of 1 to 10, 10 being the highest rating) for a week or two as you could from another that's only a 5, albeit for a longer period? No, we’re much more inclined to attribute its relative rarity to its fussiness and all the problems to which it is susceptible. Not everybody has the time, energy and willingness to please an ill-starred Goldilocks! In the past, some have called Laburnum × watereri "golden rain" tree. But that common name belongs, properly, to another plant: Koelreuteria paniculata. At present, if you hear someone say "golden rain" when they really mean "golden chain," they are most likely novices confused by the fact that the two common names have a similar ring to them (it also doesn't help that both plants have yellow flowers). But the two are entirely different: golden rain trees (Koelreuteria paniculata) are native to the Far East. This is just another example of why we should use the scientific names of plants to avoid the confusion caused by common plant names.